Over 1000 taxi drivers and private hire licence holders in Calderdale are now able to spot and report signs of child sexual exploitation (CSE). After completing a training session organised by Calderdale Council’s Licensing team, they received their attendance certificates during a ceremony at the Victoria Theatre on Wednesday 21 October. The Deputy Mayor of Calderdale, Cllr Ferman Ali, presented the certificates and there were speeches from Cllr Steve Sweeney, Calderdale Council’s Cabinet Member for Communities; Cllr Megan Swift, Cabinet Member for Children and Young People’s Services; Detective Chief Inspector Darren Minton of Calderdale Police; trainer Nadeem Mir, former Chief Inspector for Greater Manchester Police; and Mark Patterson, Chair of Calderdale Hate Crime Partnership. The event followed the delivery of the Professional Standards Training which was introduced in May 2015 – new four-hour sessions covering the key areas of responsibility for licensed drivers. The drivers are now clued up on protecting children from CSE; recognising and reporting domestic abuse; disability and access for all; keeping safe and reporting incidents; maintaining a safe vehicle and being an ambassador for Calderdale. The training is compulsory for all drivers who hold a licence in Calderdale. They must complete the course every three years to keep their licence. New applicants need to do the training before receiving their licence. The training is designed to improve customer service and protect members of the public and drivers. 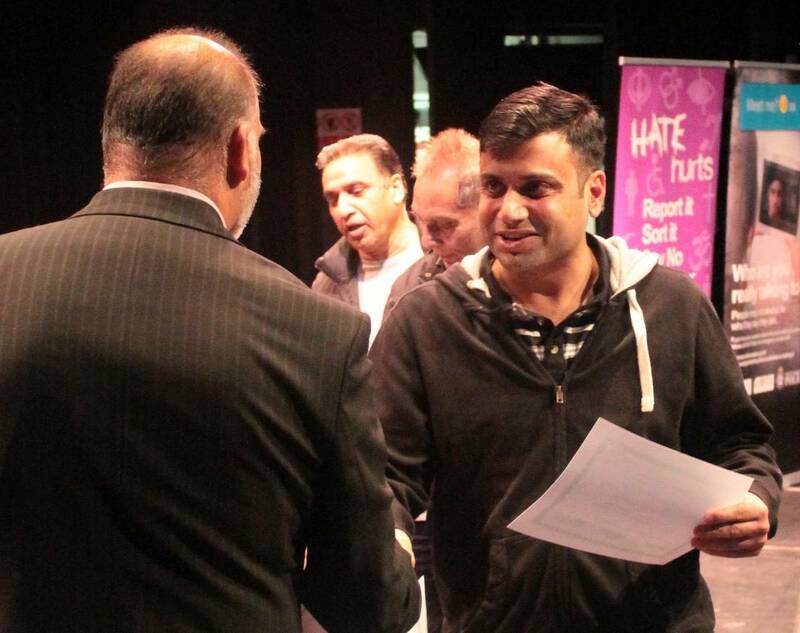 The Halifax Taxi Owners Association, the Private Hire Association, the Council and West Yorkshire Police worked together to plan the training.The sessions are delivered by West Yorkshire Police, Calderdale Council, the Calderdale Safeguarding Children Board and Nadeem Mir, the former Chief Inspector for Greater Manchester Police. “Calderdale Police co-initiated this scheme to provide drivers with extra training in Calderdale and I believe it will help increase drivers’ awareness of the signs of child sexual exploitation. “Everyone in our communities has a part to play in defeating CSE and due to their role, drivers are very well positioned to come across potentially suspicious activity. It is very welcome news that so many local drivers are now trained in helping spot the signs of this very serious offence. “Tackling child sexual exploitation is the current number one priority for West Yorkshire Police. I would ask anyone who has information about CSE to contact the force on 101. This entry was posted in Children, Community safety, Licensing. Bookmark the permalink.